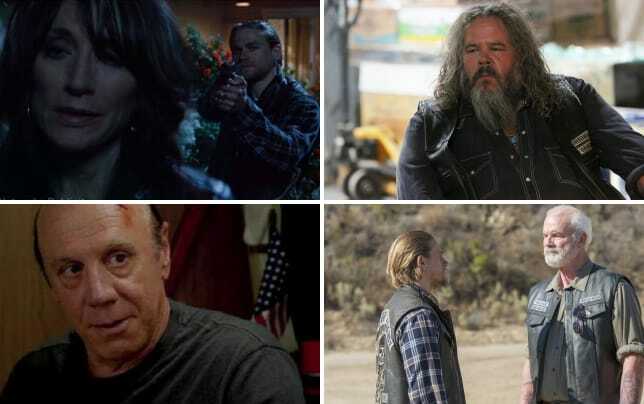 Nero tried to escape Charming and offered Gemma a way out, while Jax's plan to leverage August Marks ended with Bobby paying with flesh and blood on Sons of Anarchy Season 7 Episode 7. Any ideas on how Jax will retaliate for Bobby's attack? Leigh: At this point, hopefully the guys can get him to react more calmly and just get Bobby back without any more collateral damage. Then I think he will go even harder back at August. Lilbit O Jd: Personally with August, maybe an eye at this moment for Bobby. Amanda: Okay so Bobby isn't dead yet (based on the preview), is it bad that I want him to be? Maybe not in the next episode, but I want some major character deaths by the end of the season. I demand it! Christine: I agree Amanda, sort of. I'm surprised we haven't had more major character deaths yet but there is the second half of the season to go. As for retaliation, I'll bet Jax will go biblical and it will be an eye for an eye…and then some. Jax called the club his family. Does he put them ahead of his boys? Leigh: Yes he does. Tara was the glue that held them together. Lilbit O Jd: Yes. The street answer is yes. But no. He loves his kids. Amanda: I agree with Leigh on this one. Tara was the one holding them together and now that she is gone he does put the club ahead of his boys. He doesn't need to say it, nor would I expect him to, but his actions pretty much show that he puts the club first. Christine: Those poor boys hardly ever get to see him. They effectively lost both parents when they lost Tara because Jax has checked out. 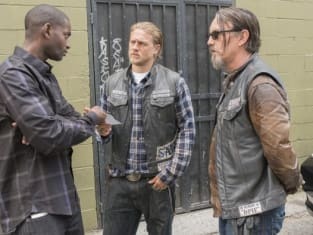 I don't doubt that he loves his sons but SAMCRO and his need for revenge obviously come first. Abel overheard Gemma confess to murdering his Mommy. Any guesses on where that will lead? Leigh: I feel like he might tell his teacher at school. No way Courtney Love's cameo was just that minute in the pickup lane right? Lilbit O Jd: Abel will put her on point telling her accidents happen. Quoting her in the clubhouse in front of everyone without telling. She'll piss herself. But revenge for mom as an ending alternative. Want them whole myself. Amanda: Maybe he will say something in front of someone else and they will get suspicious. I think Wendy and Unser both have gut feelings that something else is up. Christine: Leigh, I like that idea if for no other reason than Courtney Love's cameo was kind of useless if that's all there is. But I can just imagine something horrible happening to Gemma and little Abel coming over as she bleeds and saying, "Accidents happen, Grandma." Nero wants to buy his uncle's farm. Any chance he'll actually do it or that Gemma will go with him? Leigh: Hopefully Nero will actually do it and get him and his son out of this world. Not sure about Gem. That scene between them felt so much like a goodbye. Lilbit O Jd: I'd really like Gemma to say yes and have her unhappily ever after. They do deserve more. Amanda: I think he will get so close to buying it and then the drama will get in the way and he will be stuck in Charming a bit longer. I agree that their scene together felt like a goodbye for them. Christine: I'm completely rooting for Nero to get out and start a new life with his son but I feel like that's wishful thinking. I'm really afraid that Nero won't make it out alive. As for Gemma, I can't imagine her leaving the life no matter what happens. What was your favorite scene of the episode? Leigh: Definitely when Jax asked Rat incredulously if he was scared of Gemma and Happy, the craziest mofo of the whole bunch who is scared of nothing answered like "dude we're all scared of your mom." Hilarious. Lilbit O Jd: My favorite scene is hard to pick. I was cracking up last night. I did like the touching moments. They are unexpected. Amanda: As much as a I hate Gemma she had some good scenes in this episode. Her confession to Thomas was great and her and Nero were awesome too. Christine: Yes, Leigh! I couldn't help but laugh when Happy admitted they were all afraid of Gemma. But my favorite was Nero asking Gemma to move to the farm with him. The tears in his eyes were really heartbreaking. He knows he has to get out but he also knows she most likely won't go with him no matter how much he loves her. Don't miss a minute of the mayhem. Watch Sons of Anarchy online here at TV Fanatic. 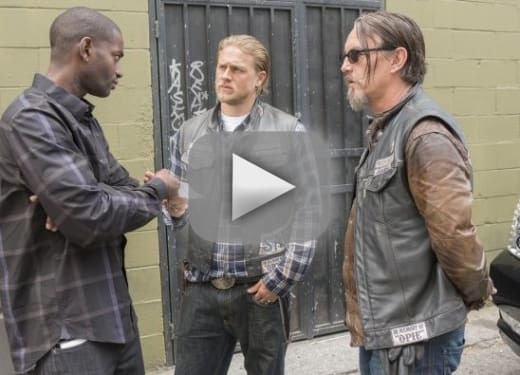 Here's a look, meanwhile, at Sons of Anarchy Season 7 Episode 8, "The Separation of Crows."